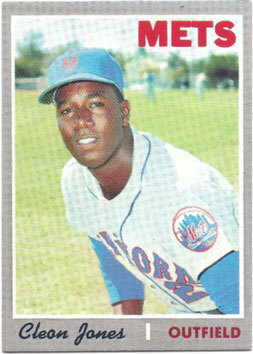 Cleon Jones hit .340 with 12 home runs and 75 RBI for the World Champion New York Mets in 1969. Until Mike Piazza and John Olerud topped it in 1998, Jones held the Mets’ team record for highest single-season batting average. I miss the posed photos that used to be a staple of baseball card production. Action photos were a rarity in the early 1970s and almost never seen in earlier baseball card sets. Even in the 1980s, card makers employed a fairly balanced mix of the two styles. Modern baseball cards pretty much relegate posed photos to retro sets like Topps Heritage and Allen & Ginter, favoring close-cropped action photos instead. If you’re not going to give me a photo that will make me say “wow,” I’d rather have one that shows me what the player looks like.